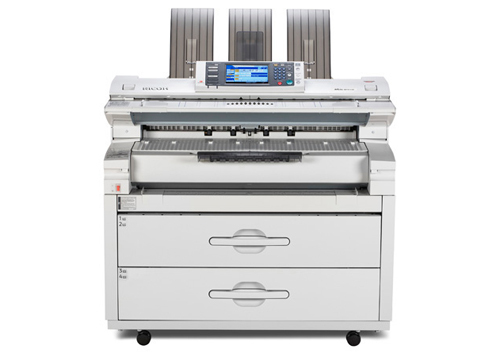 Output speeds up to 10 documents per minute. Create and distribute documents with a comprehensive selection of Scan-to options including Scan-to USB/SC Card. Manage advanced security features, including Windows Authentication and PDF Encryption, to keep your documents safe at every stage of printing and distribution. Driver support for Windows-PostScript, HDI and a Web Print Tool to build job sets from HP-GL, TIFF, PDFs and CALS file formats. The built-in security features included with the RPCS drivers provide piece of mind-Lock print, Hold print and Stored print. Scan your documents, either as multi-page Tiffs & PDFs, or single page PDFs, Tiffs, or Jpegs directly to e-mail, SMB, Folder, FTP, URL, NCP, USB/SD Card (option) and Document Server.